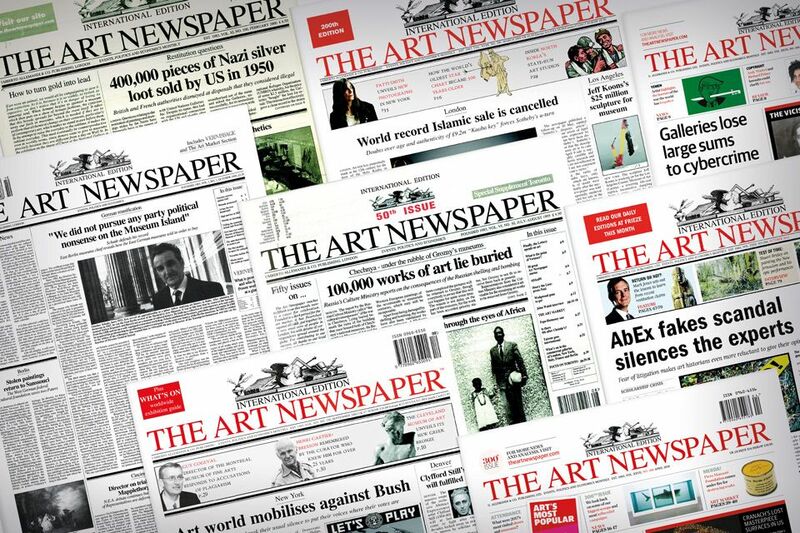 This is the 300th issue of The Art Newspaper. As I was starting, in one room on Fleet Street with a team of one and a half, there was a slump in the art market due to the collapse of the Japanese economy, but in my first editorial I called it “a pimple on the face of the art world” that would disappear soon enough, while the big news, which we put on our front page, was the reunification of the great museums of Berlin; The Art Newspaper has always existed in order to show how the art world is closely woven into, and affected by, the world outside itself. It seemed to me that no topic could be grander or more important than the reunification of eastern and western Europe, the true end of the Second World War. Shortly afterwards, I was writing the headline, Armageddon over Eden, for an article published during the first Gulf War (the Garden of Eden supposedly having been located in southern Mesopotamia), in which we listed the sites in Iraq as of fundamental importance to the history of mankind that needed to protected from US bombing raids. We have survived two more crises in the art market, one after the internet bubble burst in 2000, another after the much more serious financial collapse of 2008. The second has been different from all previous ones because it has led to a grotesquely speculative market in some works of art (Picasso, Basquiat and Warhol at the top of the tree), sucking money and energy not just out of other fields of the art market but ultimately also out of fields of knowledge—after all, why bother to study the 18th century if no record prices come out of it—and influencing the priorities of museums. Why else would the Metropolitan Museum in New York have been intending to spend $600m on a wing for Modern and contemporary art when there are already at least three other museums in the same city covering that subject, if not to maintain the bond with their rich trustees, who mostly now collect in that field and expect to be remembered for their donations of this art to the museum? I foresee that the expansionist ethos of museums, which apes the world of business, is unsustainable and potentially corrupting, or at the very least distracting from the museums’ main mission. It is clear that art is already beginning to look less deserving than other, more obviously humanitarian causes. In addition, the money risks coming from questionable sources. We have twice asked the major museums of London whether they will continue to accept money from the Sackler family, convincingly exposed as being the knowing recipients of money from their pharmaceutical company, which has ferociously promoted the sale of its opioid OxyContin since 1995, and continues to do so in the Third World, despite proof that it has led to thousands of people becoming addicted and some of them dying. Not one of the museums has disassociated itself from the Sacklers. Compare this with the public ostracisation by the Tate of the former art dealer Anthony d’Offay, 78, after he was accused of sexually inappropriate behaviour. Until then, the museum had honoured him as a major donor, for in 2008 he had made a semi-gift of contemporary art worth some £125m, which he sold for only £28m. Now, however, it seems that the past sin of an old man (mind, no due process has taken place) is far easier to condemn than that of the Sacklers, and this cannot be just because the #MeToo movement is still in full flow. One has to conclude that it is because the Sacklers have so much more to give. Issue No. 1 came out in more optimistic, less degraded times: more varied, more idealistic, less puffed up by PR machines. Against that, there is much to hope for today from the rest of the world, which hardly featured back in 1990. In Saudi Arabia, for example, an ecology of conceptual artists, both men and women, has grown up. They have taught themselves largely from the internet and speak directly to the very young, suppressed population, but also to us. Meanwhile, in Sharjah, in the United Arab Emirates, old-style patronage by Sheikha Hoor Al Qasimi of the ruling house has created the main centre for the avant-garde of the Middle East, extending to north Africa and Southeast Asia, commissioning art, bringing thinkers together and spreading the message internationally. And both have happened essentially without the influence of the art market.